Aubrey Independent School District general information and student achievement data at both district and campus levels are provided on this page. Also presented on this page are descriptions, pictures and maps of moderately priced Aubrey ISD homes that currently are for sale. The Aubrey Independent School District operates two elementary schools, one middle school and one high school. These four schools are attended by approximately 2,500 students who reside in Aubrey, Cross Roads, Krugerville, Pilot Point and Providence Village. Aubrey ISD's 2018 TEA STAAR component scaled score is 88. As is further explained in the Texas Education Agency 2018 Accountability Manual, the STAAR scaled score is calculated by first adding equal weightings of the percentage of assessments on which students’ performance mastered grade level, met grade level and approached grade level, dividing the sum by 3 and rounding it to the nearest whole percentage. This raw STAAR raw component score is then adjusted or “scaled” by using a conversion table to align accountability letter grades and scores of Texas public school districts and campuses. 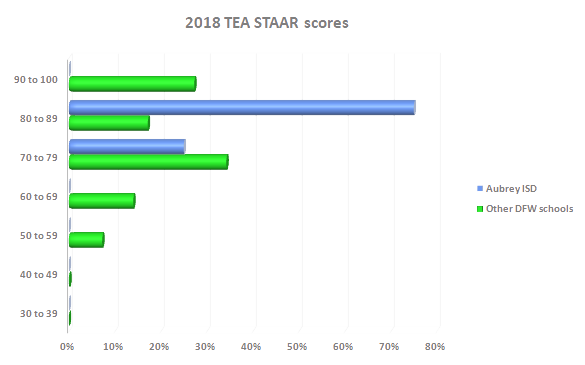 As depicted in the 2018 TEA STAARS scores graph (right) and shown in the Aubrey ISD schools table (below), three Aubrey ISD campuses attained TEA STAAR scaled scores between 80 and 89 and one Aubrey ISD campuses had a STAAR scaled score between 70 and 79. Shown below is a typical website presentation of currently listed homes that are more or less in the middle of the Aubrey ISD single-family homes price range. A similar presentation of all currently listed Aubrey ISD single-family homes is available on this Aubrey ISD homes for sale page. Adorable Single Story Home In A Nice, Quiet Neighborhood. Featuring Wood Flooring Throughout Living Room And Kitchen, New Water Hearer, Stainless Steel Appliances And A Large Patio For Summer Grilling And Relaxing. It's The Perfect Starter Home!